flavor and chewy texture. The also have a very nice nutritional analysis. Per cookie: 2.1 g fat, 2.5 g fiber, 8.5 g sugar, 61 mg sodium, 1.5 g protein. Preheat oven to 350 F. Combine dry ingredients in bowl. Combine wet ingredients in small saucepan and warm until raw sugar is dissolved. Mix dry ingredients with wet, being careful not to over-mix the batter. Drop by heaping tablespoon onto lightly greased baking sheet or use parchment paper. Flatten each cookie with the bottom of a class. To prevent sticking either flour bottom of glass or spray lightly with olive oil. Bake cookies for 15 minutes. Cool completely and store in airtight container to prevent cookies from hardening. Would ya slow down?! I haven't even found the currants for the last cookie recipe you posted! 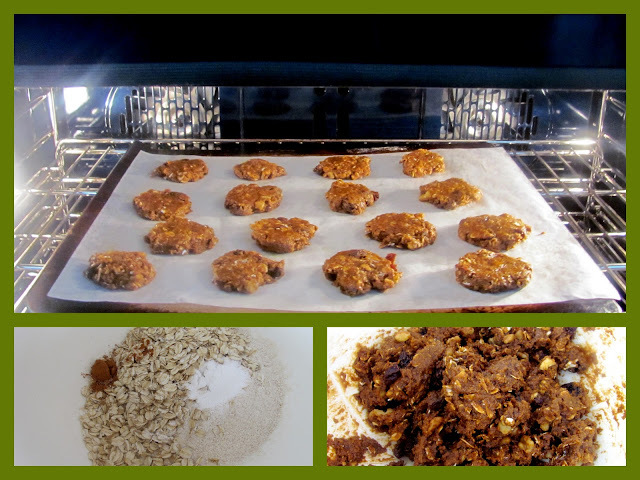 I had the privilege of being a taste tester for these cookies and they were amazing! A must make! YUUUUMY! I love this! These look not only nutritious but also healthy. Must make!